How to use Skype built-in Free Skype call recorder feature? Skype has build-in the free Skype call recorder feature, you can now use the Skype recording feature immediately if your Skype version is above 8.16. It’s easy to use, and when you’re connected, you just need to tap the ”Start Recording“ menu to record your Skype video call. See the below image. It will record your video call using Side-by-side – portrait mode. The recorded video file will be stored on the Skype server and you can download it at any time. The Skype build-in free Skype call recorder feature is already much more powerful than most third-party Skype recording software on the market, and most third-party Skype recording software is screen recording software. And most third-party recording software doesn’t offer an option for video recording mode. So you can use Skype’s built-in free call recording feature if you don’t need another recording mode. For more selectable video recording modes, you need third-party Skype recording software, such as Evaer, Super tintin. They offer a variety of video recording modes, such as picture-in-picture, side-by-side (landscape ,portrait), separate video files, audio-only, local-webcam-only and remote-webcam-only mode. 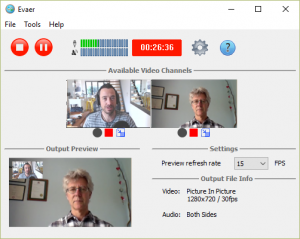 The Evaer Skype recorder is the best one for recording Skype video calls, it supports all Skype versions under Windows. You can preview the recording results while recording the Skype video call, and you can control the recorded video channel in real time. Please watch the video below to learn how to record your Skype video call. This entry was posted in Skype Video Recorder, Uncategorized and tagged free Skype recorder, free Skype video recorder, Skype build-in free call recorder on May 1, 2018 by admin.